24 - 27 September - Over a week now since my back gave out, and it is still hindering my activities in the garden, but I did manage to get done the job I had intended to do that painful day - On Wednesday (24th) I strimmed (I hate strimmers and use one reluctantly!) the garden path in readiness for our grandson who stayed with us for the next two nights. I was a bit too drastic with the strimmer in a few places, but it did uncover a reason to get down on my knees with my camera. 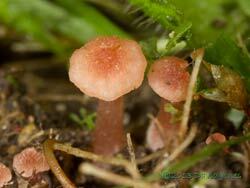 Hidden under the moss by the side of the big pond were these tiny fungi. 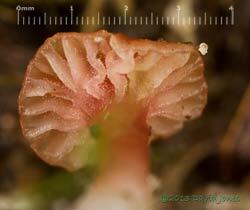 with a cap just 3.5mm across, and with relatively thick-walled gills. 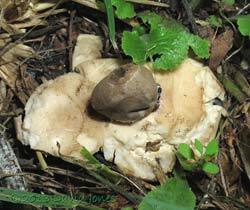 The possible Geastrum rufescens under the Rowan is now looking rather worst for wear. 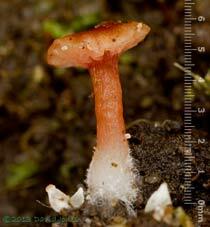 While the central spore body remains intact, I suspect that the surrounding white is being eaten by slugs. 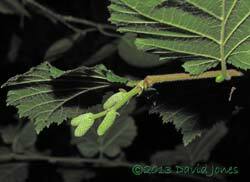 Also on the 24th I spotted that one of our Hazels has, for the first time, at least two groups of male catkins developing. I'll be watching out for female flowers which I understand will not appear until nearer to Christmas. 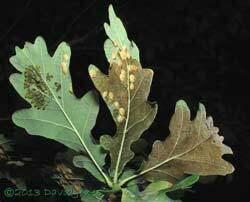 Our Oak in a pot now stands at over a couple of metres in height, and this year the undersides of a few of its leaves are 'decorated' with spangle galls, caused by the female Oak Gall wasp laying its eggs in the leaf tissue. 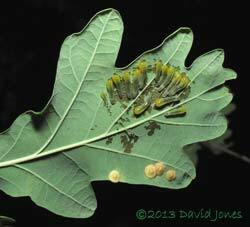 In this case the galls are sharing the leaf with a cluster of slug-like sawfly larvae, similar in appearance to those that I photographed on the Birch tree back in early July. 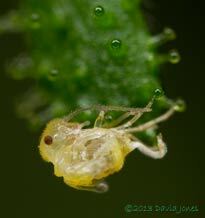 This group had clearly just moved onto this leaf having stripped much of the tissues from the adjacent leaves. Notice how they worked around the galls. And now a mystery plant, perhaps one that doesn't belong in mybitoftheplanet! Not long before we went away on our holiday together, Simon, our son (and our grandson's dad) stopped at a garage to get fuel and spotted some packs purporting to contain Venus Fly trap seeds. The packs contained seeds and an artificial growing medium. He bought a couple of packs and planted a couple of seeds from one of them. The first plant to appear failed almost straight away, but the second, seen here as it appears today (the 27th), was a success. However, what has grown from the seed is certainly not a Venus Fly Trap, and I haven't got a clue as to what it really is! It doesn't resemble any British plant that I'm familiar with and so far, my online searches have not come up with any suggestions. It has an interesting symmetry. 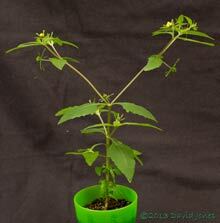 The general pattern goes like this - each leaf node has a pair of leaves on opposite sides of the stem. 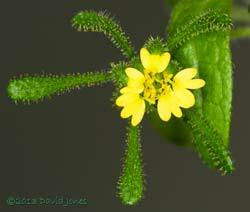 from the base of each leaf grows a branch, and centrally there is a stem topped with a flower head (more on that later). This pattern is then repeated as you move along each branch. I need to check with Simon about what happened as the original stem developed, although the rule still applies to each pair of branches above the first 60mm of the stem. The puzzle became more interesting once I took a closer look at the small, somewhat untidy flowers. 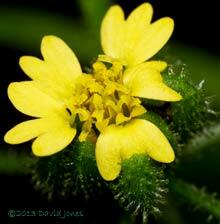 These are surrounded by a group of five structures, each measuring some 8mm or more on a fully developed flower, and which are covered with hairs on their undersides while their tops are covered with rather stubby stalks that end in glistening droplets. 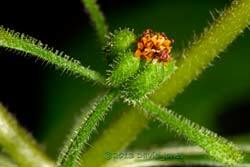 These stalks are also on parts of the flower itself, as you will see below. I had a suspicion that the 'flower' was in fact a composite flower, so I turned my attention to the examples that were still developing. 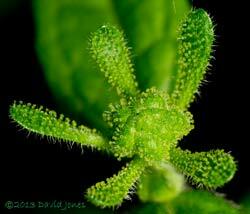 I couldn't photograph a tightly close flower bud so this one shows those five 'tentacles' just beginning to open up. 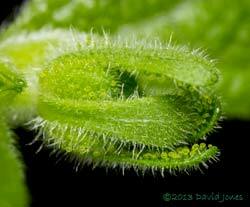 Once unfurled, they expose the centre of the bud which appears to have at least five distinct parts. 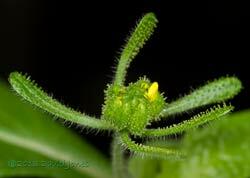 Once the sepals are fully unfurled, and have grown longer, the first signs appear of the flower's yellow petals. Looking down from above reveals that these are emerging from five separate buds, confirming that this is indeed a composite flower. Also, the central area is now divided up into at least nine, somewhat smaller buds. I suspect that symmetry would favour ten, rather than nine in this case. Notice how the outer buds are covered with those globular structures. 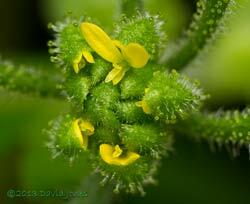 With the outer ring of five flowers fully open, the central flowers now start to emerge. If the plant follows the general rule for members of the Daisy family, the outer, Ray flowers that bear the large petals will be sterile, while the inner, disc flowers will be fertile and produce seeds. 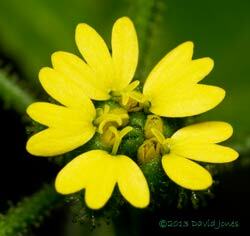 Once these disc flowers are open then the centre of the flower head looks congested. However, take a closer look and you can see the small, pointed petals surrounding each disc flower, as well as slender leaf-like stamens (judging by the amount of pollen on them). Are the brown structures the female stigmas? Three of the flowers have now passed the pollination phase and have turned much darker. I only took this one picture today. I need to take a closer look to get more details if I have time during the weekend. 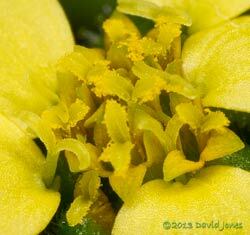 If, as it's very likely that these flowers are insect pollinated, the next mystery concerns the sticky globules. I realised that they are stick when I noticed that bits of dust readily adhered to them, but why are they present around the flower while the rest of the plant, stems and leaves, has a light covering of short, fine hairs? 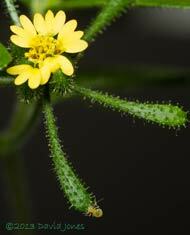 Could they emit some sort of scent to attract insects, or are they there to protect the flowers (the flower stalk itself is no more hairy than the rest of the plant). There is a third option that occurs to me, that this is an insectivorous plant and they will entrap insects that visit the flowers. I decided to test what happens when a small insect comes in contact with the globules. 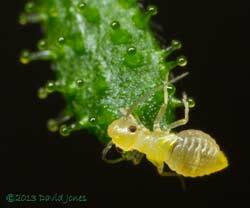 I hoped to use an aphid, but they continue to be in short supply in the garden, so I turned to a very active barkfly nymph. At just before 1pm on the 25th I introduced it via a small twig, and as soon as it ran onto the sepal it touch several globules and was stopped in its tracks. In this picture taken a couple of minutes later you can see two of its legs 'glued' by the liquid of the globules. This picture was taken at 10pm. By now it was unrecognizable as a barkfly, although I spotted some movement in its head, suggesting that it was still alive. By 9 o'clock this morning it was definitely dead, and you can see a darkening of the head area. 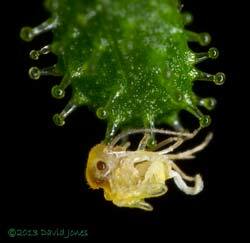 I cannot say that the plant gained any nutritional value from the barkfly, but I was surprised just how much the nymph had shriveled away in the nine hour period. 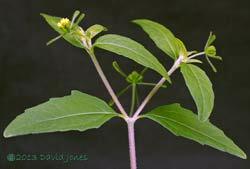 There was no visible reaction by the sepal during the process. I hope to add the large images during the weekend.